Thede are my go to meal prep staple. I make these every week because they make the perfect protein packed snack to have on the go. Super simple and you can literally add anything you want to them. Here's how I made these & what you need! I didn't measure anything for them and you really dont have to so pardon the lack of specifics. Spray a muffin tin (12 count) with non stick spray of any kind. Pour the pint of egg whites evenly in each cup. If you are using eggs, just place one egg white in each cup. Add a splash of milk to each. 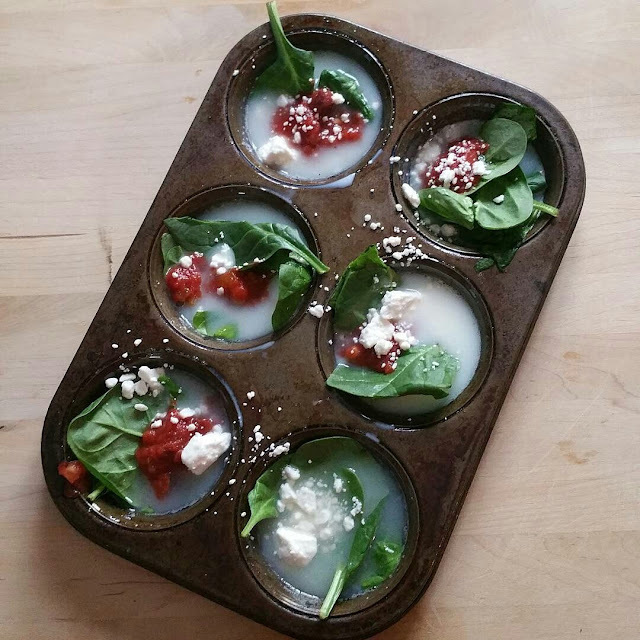 Place a few leaves of spinach in each cup then sprinkle some feta on top. Add a small amount of salsa to each one (about a teaspoon or so) them sprinkle with seasoning and bake at 375 for about 35 to 40 minutes. I like my eggs very well done so I sometimes cook them longer. Let them cool and remove. Super easy and so good!